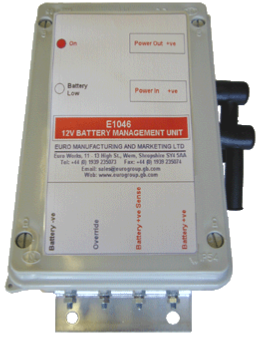 This unit was designed to monitor the voltage of a battery and connect or disconnect a load of up to 200A. 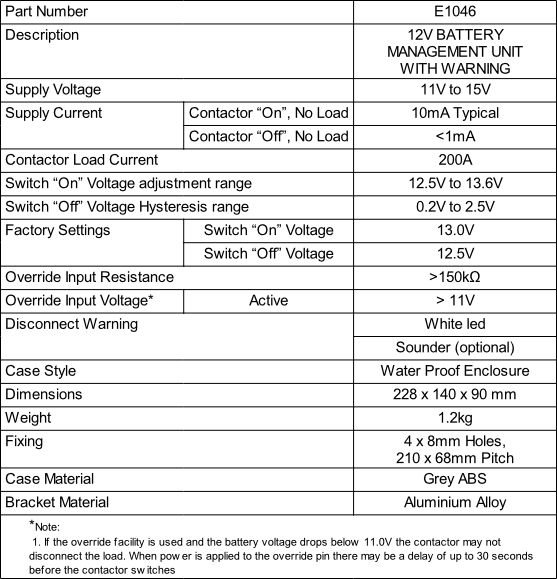 When the battery voltage is above the Switch “On” voltage (13V) the load is connected to the battery. When the battery voltage drops below the Switch “Off” voltage (12.5V) the “Low Battery” warning light emitting diode (led) lights for 2 minutes, then after a short delay the load is disconnected. The unit then switches to low power mode until the battery is recharged and the voltage rises above the Switch “On” voltage, then the load is reconnected to the battery. An override pin allows the load to be connected1 for emergency use only. To reduce power consumption to a minimum (10mA “On”, < 1mA “Off”) a latching contactor is used. When the contactor is “Off” the coil is pulsed for approx. 2 minute before the unit goes to low power mode. The Switch “On” and Switch “Off” voltages are factory set but can be adjusted by the customer.